For most new coaches, one of the biggest blocks is doubt in oneself. We’re usually worried that without being extensive in an area, we might not have done enough. Worse yet, we believe we will be called a fraud. Or what if, at some point in the session, we don’t have an answer, or don’t know what to say? So here’s the message for you: YOU HAVE A LOT TO OFFER! Not many people really listen. Good listeners are few and far between. Most people practice the art of waiting for someone else to stop speaking so that they can have their turn. Really listening is a fantastic service to provide. It’s amazing how much someone will get done when they know someone will ask them next week: “How did you do?” By being there – across the table or on the other end of the phone – you’re helping them focus their attention on what is important in their life. You are a support. Many people run with a running partner. Without their partner they might not run as far, or even at all! However, with a partner, their attention is focused on running. They run more often, further, smarter, have more fun, and so forth. Partnering with someone in their success is a powerful service to offer. Hearing ourselves speak out loud takes our thoughts to another level. Speech brings thoughts out into the open rather than just having a conversation in our mind. Speaking our thoughts out loud to someone allows us to ‘test’ our ideas/thoughts. It also helps us to hear them in a different way as the coach repeats back to us what we have just said. Putting ideas into words helps them become clearer. As they speak, clients get clarity about an issue. There can be value for them in simply speaking aloud whatever has been in their mind all week. Stating an idea, dream or vision gives it a life. We all have “blind spots”: aspects of our lives that we can’t see clearly because of habit, emotions or being too close to the situation. When it comes to our own lives, many of us “can’t see the wood through the trees”. Often when we get a different perspective on our lives, it comes from someone who, in turn, has their own particular take on the issue based on their habits, emotions and relationship with us. Having someone who is both an objective third person, but is also someone who we can trust, is a winning combination. No matter who you are, you’ve learned things that could be helpful to someone else. You might be married, divorced, in love, out of love, healthy, unfit, rich, poor, a parent, an orphan, employee, boss, etc. You may have worked at a summer camp, played in a band, run a marathon, switched careers, grieved for someone lost. Regardless of your experience, there are things you’ve learned along the way that will allow you to empathize with another. You can use your life experience to understand, listen, perceive, and help someone through a situation similar to yours. Other questions that were asked in Coaching 101 this week. I have an expertise outside of coaching, can I incorporate this into my coaching? 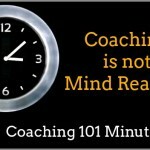 What does continued education look like in coaching? 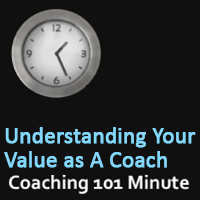 Come along to an upcoming Coaching 101 class and learn more about coaching in general as well as programs offer here at ICA. Is Coaching an Art or a Science? What Does Trust Have To Do With Coaching? Is Your Mind Full or Are You Mindful?